About Andy L. Message Andy L.
Andy was a great tour guide; helpful and friendly. He helped us buy pomelos from the side of the road, took us on a hike after viewing the Longji terraces, and recommended restaurants after our day ended (even sending pictures of the restaurants so they'd be easy to find). We hired his cousin a day later for drive us from Yangshuo to the Guilin airport in a comfortable van for a price lower than quoted by our hotel. Two minutes after the pickup time Andy texted to make sure everything went smoothly. We were impressed by Andy's professionalism - every detail was planned and the tour went exactly as scheduled. Responses to questions at the planning stage were fast and accurate. The other side of the coin is that when we were with him he was rather distracted with planning future tours and not always totally engaged. This was not an issue for us, just a comment. We would definitely use him again. excellent tour - would highly recommend. andy was great - good communication prior to booking, punctual, polite and very knowledgeable. His spoken english is very good. thanks andy. Open person, active and smiling. Supporting in our extra requests and for sure he contributed to make China experience unforgettable. I suggest to take the rice field tour and the bike and bamboo boat tour in Yanshuo: unique experience. Andy is very kind and supportive, knows the area very well and take spots apart from the crowds and masses during chinese holiday. Even arranged the evening cruise for us!! Can absolutely recommend. Would have been top notch if he also explains a bit more about the history of the rice terrace. Our guide, Andy, was very polite and flexible. He agreed to pick us up from our hotel, in Yangshuo and after the tour, he droped us in Guilin train station, which was very convenient. He answered all our questions, he was patient discreet and cheerful and he took us the best family photo of our trip ! We highly recommend both the tour and the guide! Andy is a great guide. He knows very well about the history of the places he went with us. He is very nice, very discreet but also very cheerful. His English is excellent and he can even speak some French! He has been very helpful and he even took us to the train station so that we could catch our train. The whole family highly recommends Andy, who is a nice person and an amazing guide. I booked a private tour for my family of 5 people because I wanted a hassle free, flexible tour schedule. I got exactly what I wanted! Andy organized a nice tentative itinerary for our 5 days in Yangshuo/Guilin. He was always on time and well prepared and even had a case of bottled water for us. His English was decent and communication was not a problem. The two restaurants that he recommended turned out to be our favorites. I would definitely rebook with Andy and wholeheartedly recommend him. Had a nice tour along the rice fields with Andy. His English is excellent and he gave us a lot of information along the walk, which was nice. We went to longji rice terrace with Andy and he was an amazing guide. We never felt rushed throughout the trip and he was very informative. His English was very good. I would definitively recommend anyone looking to go to the rice terrace to book with Andy. I rate our experience with Andy a five star. Thanks for a wonderful time Andy!! We enjoyed a lot our tour with Andy, he is a very good guide. He took enough time to explained us the history and interesting fact of all the places we were. Great experience for me, my husband and my two children (5-9 yo). The views are beautiful and the people is very nice there. Very recommended. Andy was an outstanding tour guide! My 3 friends and I used him for one day to tour Yangshuo by scooters and it was the most amazing day. He knows all the best places to go and had a smile on his face all day! If you're in Yangshuo and don't use Andy, you're doing it wrong! In German: Die Tour mit Andy ist absolut empfehlenswert! Er holt einen beim Hotel ab, fährt einen nach Longhsheng und macht genau die Tour dort, die man haben möchte, ob touri-mäßig oder sehr individuell. Er sorgt auch für gute Pausen. Sein Englisch ist sehr gut, er ist zuverlässig und hat wirklich ein wohltuend sauberes Fahrzeug. Wichtig ist auch, dass er vernünftig fährt, denn die Dahrt nach Longsheng zu den Stosszeiten ist echt gefährlich, wenn man einen typisch chinesischen Fahrer hat. This tour was exceptional and Andy was a fantastic guide. He is courteous, friendly, knowledgeable, and reliable. I was extremely impressed with him and the tour was wonderful. This tour is a really unique experience and Andy can customise it to fit your needs. He is an excellent communicator and will make your trip very comfortable. His English is excellent and while some folks may not care, I really appreciated the fact that he did not smoke (rare for China). His car was comfortable and clean. A++! We highly recommend this tour and Andy is terrific as a guide! The area is stunning and Andy knows it well. Highlights of the trip for us were a morning bike ride through the countryside and a steep climb up a mountain for a spectacular view over the river and mountains all around. Andy's English is excellent and we enjoyed our time with him. The tour and Andy get top ratings from us! We had a great time in Guilin and Yangshuo with guide Andy. Andy has a ready smile, is punctual and organised. We had to make some changes to our itinerary due to rain and Andy was able to re-schedule so we can see/do what we had wanted to. Thank you, Andy! Andy is one of the best tour guides I had in China. He is very knowledgeable in local culture and I am very impressed by his flexibility to tailor make itinerary based on my request. The tour is great and Andy is very nice, helpful about our needs, and have a good english. We can also change the itinerary and he gave us an amazing suggestions about tulip park. We're very satisfied, thank you. My niece was coughing during our trip in Guilin. He was patiently taking us to different hospitals & help us speak to doctors & nurses. It was very nice of him! Andy is a great guide and a very nice person; under extremely adverse weather, poring rain for more than 24 hours in a row, he made our tour enjoyable, interesting and well documented. He found the way to go over the circumstances and always with respect, dedication and a smile on his face. I highly recommend this guide. Andy was very prompt and reliable. He accompanied us to each location. We are extremely happy with the tour. Andy is a likable person and we will be recommending him in the future. Will highly recommend Andy to friends who are coming to Guilin. We were able to have a pick up time that suited our itinerary and had a great day out at Longji rice terraces. We weren't rushed at all and had time for my elderly mother to wander around at here own pace. A perfect tour with absolutely no complaints. Andy speaks great English and has a good sense of humour. Thanks Andy - my parents thought you were wonderful! Andy was a fun, enthusiastic tour guide. His English is very good. We would recommend him to friends. Amazing trip. Andy was a great guide, taking the time to explain the travel plan, make changes as needed, suggest alternatives etc. Andy was there when you needed him and at the same time he gave me a lot of space to myself. Definetly will use Andy again! Andy is a great guide that we would recommend to anyone. He is friendly, helpful, flexible, open to plan changes, fluent in English, and always knows the best route to the sight-seeing locations. He manage to help us avoid all the big tour groups so that we can enjoy the sights without being overly crowded. We hope he will further improve the tour experience by telling more Chinese stories/poems that are related to the sights/areas that we were in. Andy was very friendly and went out of his way to show us places and lead us on adventures we would never have had with a large group (or found on our own.) He also had a nice car and was an excellent driver. And, believe me, you really want a good driver in China! He was always willing to deviate from the defined tour if we wanted to add a different site - and when we were limited on time, he would gently suggest what we might want to skip. Great experience. We had a wonderful time in Guilin with Andy! He was full of information, spoke excellent English, and was fantastic with our two kids. When booking our trip we saw that the tour we wanted to book for our last day in Guilin was all booked up. Andy said not to worry and that we'd take care of it when we got to Guilin. I was worried, but he booked a wonderful day tour of Guilin's sights with a wonderful guide! Thank you Andy! Andy customized the tour to meet my needs and handled everything including airport transfers. Even though the weather was not perfect, I enjoyed the private boat tour on the river and the bicycling afterwards. I had very limited time and Andy made that time well worth the flight from Shanghai. If you are going to Guilin then you need to book a tour with Andy! My two adult sons and I spent two days with Andy: one in Guilin and one bicycling the countryside around Yangshuo. Andy was cheerful, punctual, reliable and accommodating. His English is excellent. His knowledge of the little paths outside Yangshuo allowed us to see villages that we never would have been able to see on our own. He tailored our tours to our specific requests and we thoroughly enjoyed our time with him. Andy showed us an non tourist road in the Longji rice fields. It gave us an incredible, breathtaking and beautiful impression. An absolute must have seen when you are in the Guilin region. We booked the private tour and we had a seperate air conditioned room for our group on the boat but most of the time we stayed at the top of the boat to enjoy the beautiful nature creations. Afterwards we did a bycicle tour. Which showed us the beautiful insides of the area like Lotus and rice fields & other views on the Liriver. It was no problem for Andy to stop every 2 minutes to enable us to take pictures. He even enjoyed it to play our cameraman so we had group photo's. It are well organized tours. Fantastic day. Good company. Very informative. Highly recommended. Andy provided just what he said he would: airport pickup, 3 nights hotel accommodations, breakfasts,and tours with a driver. Our favorite activities were the bamboo rafting in the early morning, cormorant fishing demonstration, Fuli old town, evening light show in Yangshuo and walking in the rice terraces. The afternoon rafting on the Li River is too crowded and we could have skipped the Pearl "Museum" which is just a shopping stop. Even in the rain we enjoyed the Elephant Trunk Hill and Reed Flute Cave. After a 'not-so-great' experience yesterday afternoon with a group tour, being with Andy on our private tour was not only a breath of fresh air but a real eye-opener. His knowledge of the area exceptional - he is more than happy to answer your questions. He is patient and will allow you to stop wherever you like to take as many photos as you like. He is full of energy and has a great sense of humor. Most importantly he is passionate about nature and his job. What you see is what you get --no sales pitch! 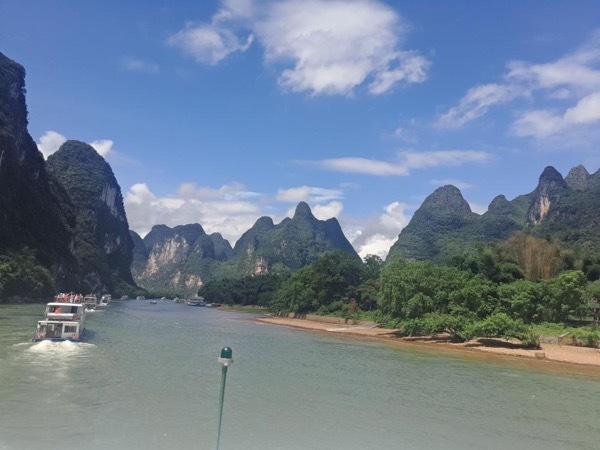 The Li River cruise was memorable for the breathtaking views. The bicycle tour through the countryside gave us a glimpse into life outside the normal tourist spots. Andy's energy, enthusiasm and knowledge made for a wonderful day. The tour of Guilin was everything we hoped it would be. Andy was very helpful when accomodating our schedule and needs. The tour included all of the sights we wanted to see and Andy was very knowledgable about the history associated with the tour. His english is excellent and his sense of humor was delightful. My Husband and adult daughter and I had 3 days in Guilin with Andy as our guide. He was fantastic. Enthusiastic, cheerful and very entertaining. His English is very good and nothing was too much trouble. The scenery around Guilin is simply mind altering. We took the Li River cruise and a day trip to visit the Rice terraces both of which were awesome. Guilin was the scenic highlight of our trip to China and should not be missed. Andy made our trip to the Rice Terraces an awesome experience. He speaks exerlent English and had a very good knowledge of the area. He is very funny and energetic with a great sence of humour. He obviously loves his work and genuinely appreciates the spectacular natural beauty of his homeland. We felt priveladed to have him with us and would not hesitate to recommend him. We parted feeling we had made a genuine friend in China. Our trip on the LiRiver was amazing, Andy was "the Master", Cheerful, Funny and Enthusiastic. He obviously genuinely likes people and loves his work. His command of English is brilliant. He has a great sense of humour and made the day a hassle free experience. He even managed to encourage me on to a bicycle for the first time in 30 years, for a wonderful cycle tour through the village. Any one visiting China, must see Guilin and book Andy for a great experience. Andy was incredibly helpful, from planning what tours to take before we booked, to all the details of the great day we spent on the tour. Trust me, this help is priceless, there are so many Li River cruise options available of widely varied quality. The spectacular scenery of the Li River has to been seen to be appreciated; this is a must-see during a trip to China; and the bike tour takes you through more wonderful scenery. We spent the next day with Andy on the Longji tour, be sure to check it out. Andy was a great guide! Our Li River cruise was THE highlight of our entire time in China. We visited Beijing, Shanghai and Guilin and this was by far the best part of our trip. Andy was very knowledgeable about the area and very personable. He even took the time to take pictures and e-mail them to us. We would definitely recommend the Li River Cruise and Andy!